Last night, right before bedtime, I was typing away on my laptop, writing out a pivotal scene that involved a character fending off a knife wielding attacker. Matt climbed into bed next to me and glanced over. "Do you want to hear it? It's the scene I asked your advice for." "Yeah, remember, when I asked you how you would fend off a knife wielding attacker who tries to surprise you from behind if you were unarmed?" I have a husband who has been trained by the US government in multiple forms of combat, so I recently decided to start taking advantage of his expertise. Plus he reads a lot of fiction that involves fights and battles and the like. "Yeah, and I said I'd stomp down on his foot to break his instep." "That's what I did. Do you want to hear it?" So I read him the three or four paragraph section. "Yes, a fight scene should be less wordy and more violent." "My intended audience isn't as bloodthirsty as you are." "Still, even for your intended audience, it is kind of wordy." I asked him to indicate a part of it that could be eliminated, cut out a sentence, and sulked about how he refuses to edit my work because it isn't his genre (Admittedly, he is not my intended audience AT ALL, but I still think he could put up with my sappy love story at least long enough to give me some constructive criticism. He read the first installment and gave me some vague comments, but nothing really helpful.). As I have mentioned once or twice before it is hard to get opinions on your work and editing on my own always feels like plucking my eyebrows, both because it is mildly painful and because I'm always afraid I'm taking away too much. There is also the word count issue, and this one is a little silly. A traditional length for a novel is 50,000 words. It is the length set for the NaNoWriMo challenge and while a lot of novels are longer, you don't see a ton that are shorter. Dragon's Curse currently sits at 52,780. That includes chapter headings and dedication and all the non-story stuff too. I'm a little worried that it can't afford to loose too many words. It's such a thin little novel. It feels wrong to put it on a word diet. Still, if the words aren't needed, I really shouldn't have them, right? Even if they pad my word count. I went on a bit of a "well that's my writing style" sulk for a bit too, but I know that isn't really an excuse. It's like saying bad grammar or incomprehensible sentences are your writing style. You can't just embrace an obvious fault and move on. I do think that there is a place for "sparse" writing and a place for wordier descriptive pieces, but my problem is more rambling than describing. I take a sentence and I stretch it out and twist it around and add clauses and commas and a lot of it is me saying the same thing in a different way because I like how both ways sounds and want to use both, which really isn't necessary (and which I kind of just did with the sentence you just read). I returned the book to the library and can't find it on the interwebs, so I don't have the exact quote, but Neil Gaiman wrote in his introduction to The Thirteen Clocks that he used to pretend he had to pay for his words rather than think he was being paid for them so that he only used the most essential. If an award winning, internationally beloved writer of such classics as Coraline, (my personal favorite. I haven't read everything he has read, just Stardust, Neverwhere, and the Graveyard Book, oh and watched his two episodes of Doctor Who. . .), anyway, if that guy has advice on how to write, it is kind of conceited to ignore it and say, "Well that may work for you Huge, Newbery, and Carnegie Medal Award Winner Neil Gaiman, but I'm going to do it THIS WAY!" My first instinct is to print up a copy and go through and red line every word I can't justify. My second is that I desperately need a second opinion. 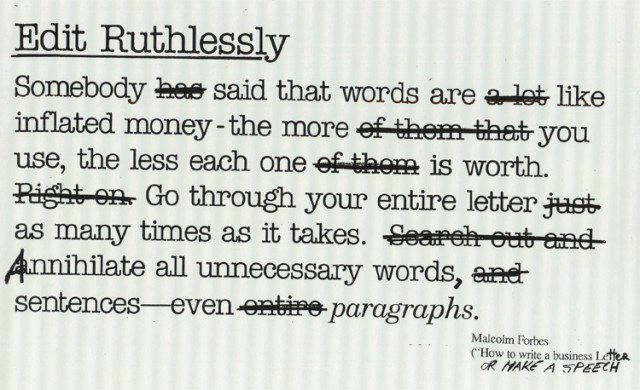 This is what professional writers have editors for! But I'm on my own for the most part. No one is getting paid to work on my stuff. I recently joined Scribofile which is an online writers critique community, but you have to give critiques to earn the right to post works to be critiqued, and I haven't had time to really do this (if I do critique something, I take it seriously. I don't just do a read through and give some half-hearted good/okay/whatever at the end.). In my wildest dreams Neil Gaiman would see this and loan me one of his editors, but if Neil Gaiman jumped every time he was mentioned on the internet he'd be like one of those super bouncy balls constantly "boing, boing, boinging" around the world. So the question is, how ruthless with the red pen am I going to be this time? 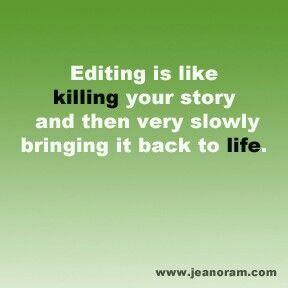 you know, when I start to edit this is exactly the same problem I run into. Good luck. And hugs! What I try to do is stop second guessing myself and just go with it.